Muay Thai is a martial art that has been developed hundreds of years ago and is an ancient way of exercising power, total efficiency, and crude simplicity. It is based on a combination of kicks, punches, knees, and elbows with flexibility and grace. It is also known as the “Art of Eight Limbs” and is an excellent martial art which originated in Thailand. Many martial arts have been rendered as a sport, and Muay Thai knew as Thai Boxing is also a popular sport now. Due to its effective striking techniques and robust training regimes, the one who plays this martial art has an extraordinarily flexible and sturdy body. This art utilizes fists, feet, elbows, knees, and shins (as well as the head traditionally, though this has been removed from modern competition). In this form of martial art, there are two main competitors in a ring, and the ultimate motto is for one fighter to emerge victorious at the contest by knocking the other opponent. The opponent gets stopped by the referee as unfit in health to carry on (knock-out) or winning on points. In Must Thai, all the fighters make use of their fists, feet, shins, elbows, and knees to try and win the fight and them also make use of grappling teaming up with clinches occasionally. 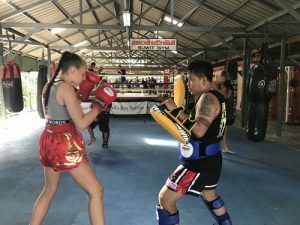 Muay Thai is exceptionally combative, and it involves a lot of physical wear out, the fighters need a lot of skill to win the higher level competitions. Before every match, all the boxer pays homage under the heritage. Once homage service is done then the fight is ready to begin, and here both fighters shake hands. Muay Thai bouts have 5 rounds each of 3 minutes each, with a two minute rest period in between each.